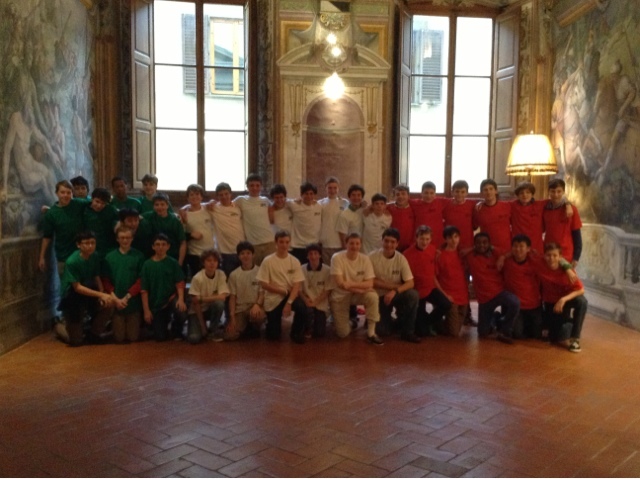 After lunch and a tour of the frescoed dining hall of the palazzo by Poccetti (heavily influenced by Michelangelo) telling the story of the Capponi family, the boys pose in the colors of Italy. 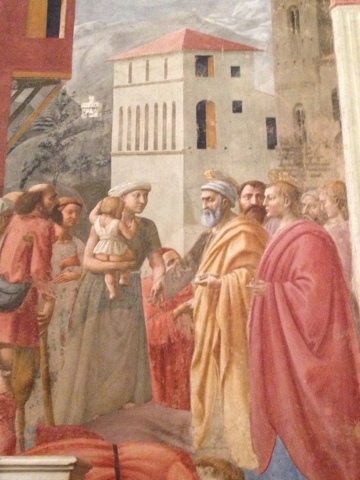 Here in the Brancacci Chapel the boys study in situ the work of these three great Renaissance artists--viewing scenes of the life of St. Peter and scenes from Genesis--The Temptation (Masolino), and The Expulsion (Masaccio). 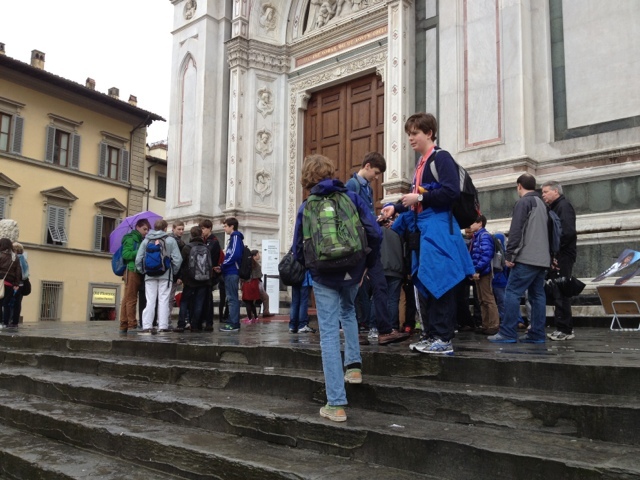 So it's a little wet this morning, but none-the-less we arrived on time at Santa Croce. 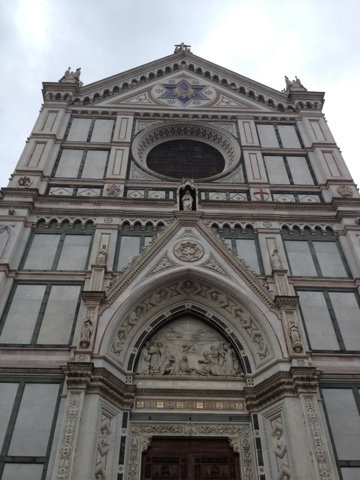 The Star of David adorns the facade, inside the boys will see Michelangelo's monument caved by Vasari, a beautiful bronze Annunciation by Donatello, and truly authentic frescos by Giotto in the Bardi Chapel. 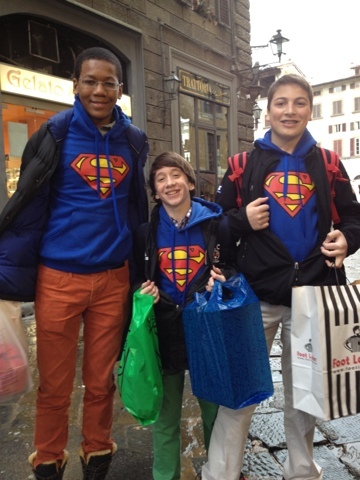 After a morning at the Accademia and the Bargello where the boys critiqued Verrocchio's, Michelangelo's and Donatello's David--all Renaissance interpretations of our school's young biblical namesake, among other things--they end their day together. In the video attached, I've captured the boys in evening class reflecting on their day. 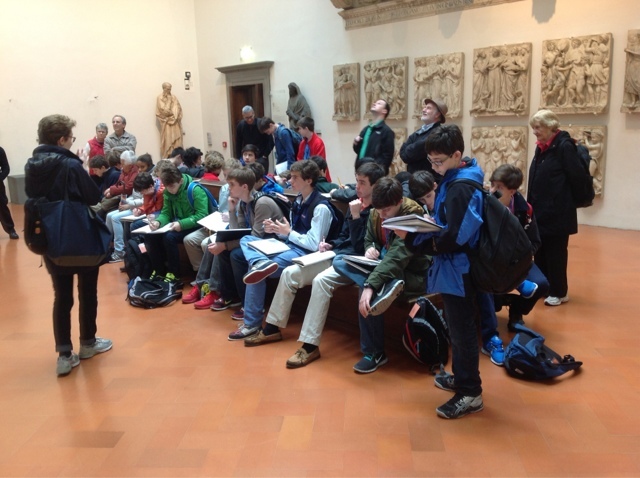 At both San Marco yesterday and the Museo del 'Opera dell Duomo today, the boys were busy critically viewing, sketching and examining highlights of the Florentine Renaissance. 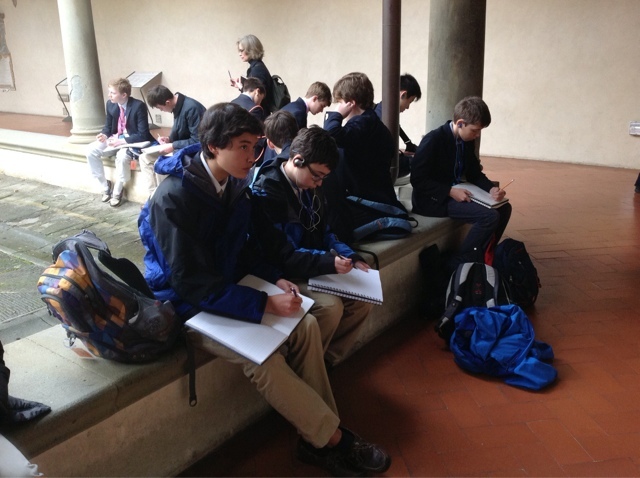 In the pictures below you see the boys sketching details of the courtyard of S. Marco yesterday before marveling at Fra Angelico's frescos, especially 'The Annunciation,' on the upper floor of the convent; and at the Museo today examining the sculptures of Donatello, Della Robbia, Pisano and of course Michelangelo's Pieta--that he carved as his own funerary monument with Nicodemus (carved in Michelangelo's own image) supporting the limp body of Christ. 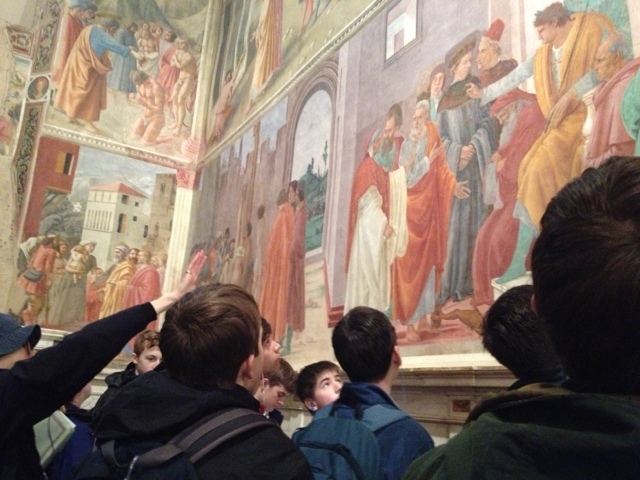 The boys also examined the great doors of the Baptistry today by Ghiberti, so beautiful that Michelangelo referred to them as the 'Gates of Paradise'. It doesn't get too much better than this! ... has not dampened the spirits. Il Duomo, Museo dell 'Opera del Duomo and San Lorenzo this morning. This afternoon, between showers, the S. Lorenzo Leather Market. On Wednesday evening, Saint David's had the distinct pleasure of hosting H.R.H. Zeid Ra’ad Zeid Al-Hussein, Permanent Representative of the Hashemite Kingdom of Jordan to the United Nations and H.E. 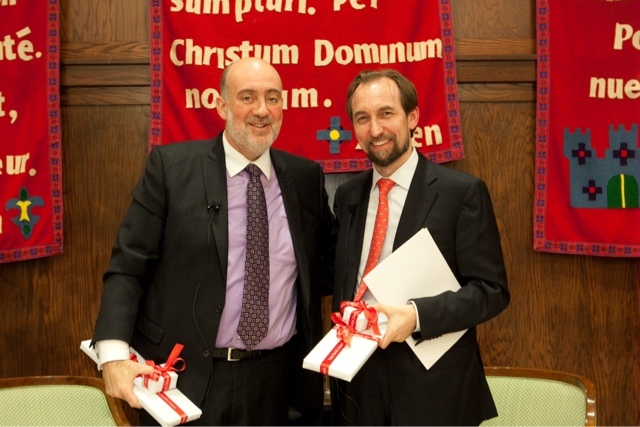 Ron Prosor, Permanent Representative of Israel to the United Nations. The ambassadors visited Saint David’s for an engaging conversation framed by the school-wide theme “true community” on the future of peace in the Middle East. Hyman Hall was filled to the rafters and the audience did not leave disappointed. The evening, sponsored by the school’s Committee on Community, posed the question of whether true community could be attained between Israel and the Arab nations of the Middle East. Our guests shared their perspectives on the obstacles to the peace process, the current political turmoil in the Mideast and differences in approaches to the peace process. The ambassadors concluded the evening's conversation by exploring what they felt would be needed in order to move forward in the region. While both expressed dissatisfaction with the current state of the process, each ended the conversation with expressions of hope that peace can be achieved. As our school continues to explore the concept of “true community” this year, last week's talk was a reminder that to truly be a community requires commitment, understanding, and the ability to accept and respect differences. In between rain showers the boys gather for a group photograph. Rome is a buzz with speculation and anticipation. 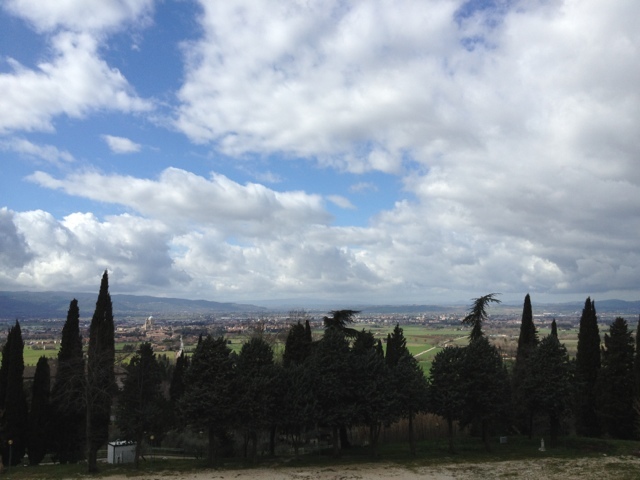 Beautiful day in Umbria. The skies have cleared for the first time. 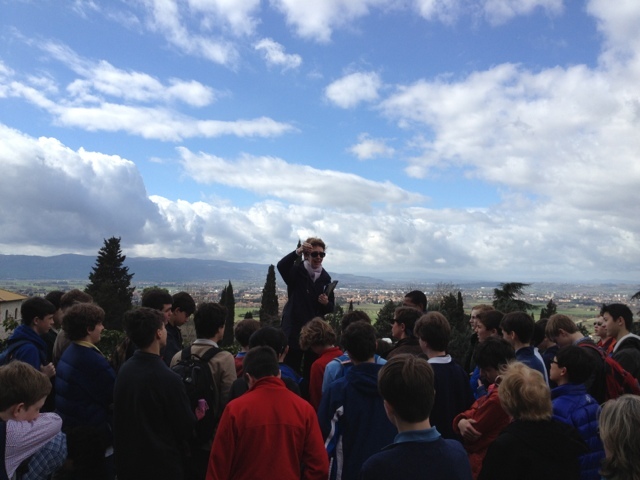 Before climbing the mountain the boys stop for Chapel overlooking the valley. At chapel they learn of the tau cross and its representations. 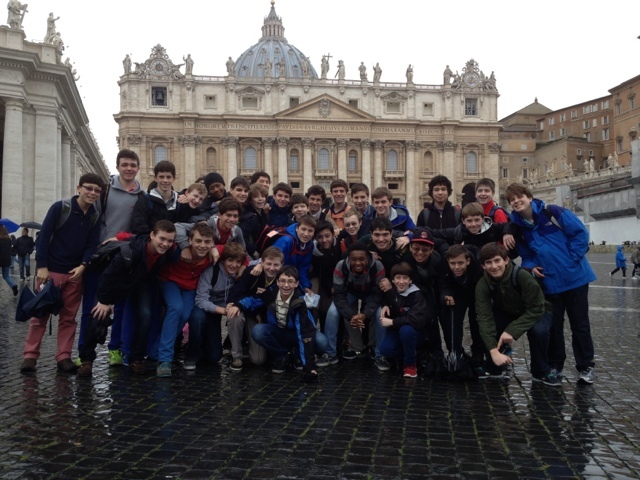 The boys spent the afternoon at the Vaticano. 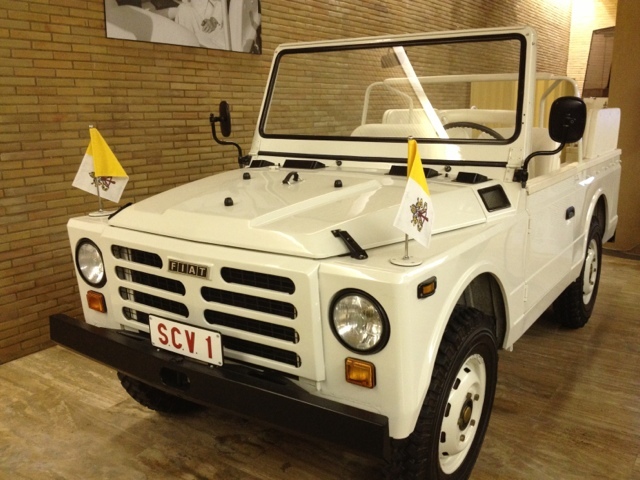 Pictured here is the car Pope John Paul II was riding in when he was shot twice in St. Peter's Square, where the boys were just standing earlier in the day, back in 1981. 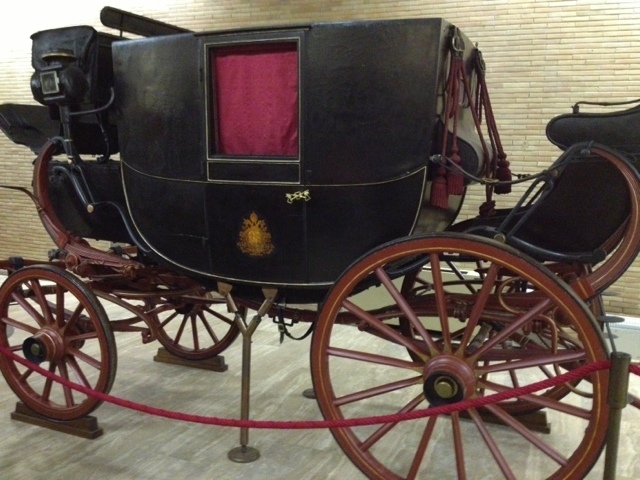 The carriages of the popes through the centuries fascinated the boys. 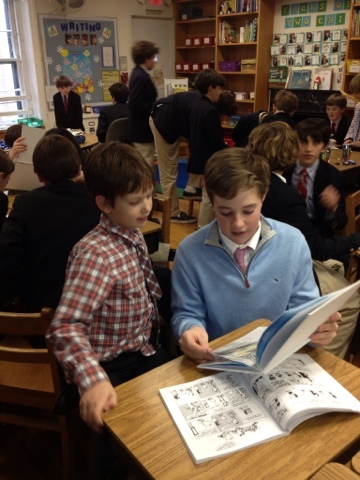 Right before departing for Rome, I dropped by 2 Chi to witness 7th grade boys reading and sharing literature with their 2nd grade buddies. Good role models are so important. They get together frequently. I'm so happy I caught them. I just love schools. Today two boys intercepted me in the hall and unexpectedly invited me to listen to two recorder pieces they had been working hard on with their teacher. I accepted the invitation, and subsequently visited their classroom. I was so glad I did. Below is the first of their two pieces. It is an older piece entitled "Ronde: Wo Bistu" by Tielman Susato (died c. 1561). The second piece, which I didn't record, but that was equally well played was "Allemande" by Johann Hermann Schein (1586-1630). First thing this morning members of the 3rd Grade Squirts gathered in my office with a golden trophy in hand. Proud, they recounted, in vivid detail, their weekend of competition up at Lasker Rink. The two-day hockey tournament involved twelve teams, including St. Bernard's, Buckley, Browning, and a variety of other area club teams. Half the teams played Saturday, while the second half played Sunday. The winner of the Saturday division then played the winner of the Sunday division for the Lasker Cup. Over the course of the tournament our Squirts clinched 5 of their 6 games to win the Sunday division. They then went on to play the Lady Hawks for the championship. It was a spirited game, I am told, evenly matched with lots of back and forth with the puck. The Lady Hawks won in overtime with the Squirts capturing 2nd place. What an outcome! 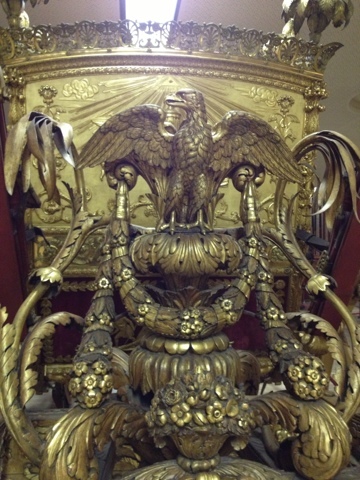 The photo of their visit this morning is above and the cup is proudly displayed in the school's lobby for all to see.